Unrelated animals, lemurs and meerkats differ more than they resemble each other. Lemurs are a diverse group of 100 or so species of primates; meerkats are a single species of mongoose. Most species of lemurs are endangered, while no species of mongoose is endangered or even threatened. While some lemurs are herbivores and others opportunistic omnivores that diversify their diet with insects, all meerkats are carnivores. The squirrel-sized meerkat grows to a height of 10 to 12 inches, with a tail about as long as his body, and weighs around 2 pounds. Lemurs vary greatly in size, but are generally small to medium-sized primates. The pygmy mouse lemur, 2 to 5 inches in length and weighing 1 to 4 ounces, is the smallest primate in the world. Ring-tailed lemurs grow 15 to 18 inches in length, and can weigh up to 7 pounds. All lemurs have long, bushy tails and slender bodies and limbs. The largest lemur, the indri, is about 28 inches long and weighs up to 20 pounds. Lemurs’ fur varies in coloration depending on the species, but all meerkats sport a gray, tan or light brown coat. Despite the diversity of the Lemuridae family, lemur species exist solely on the African island of Madagascar and small surrounding islands. Meerkats are also African but live in south and western regions of the main continent, including portions of South Africa, Botswana, Zimbabwe and Mozambique. Lemurs are arboreal creatures that inhabit rainforests and scrub forests. In contrast, meerkats are burrowing animals who dig extensive underground tunnel systems in the open, arid plains, on the savannah and in desert areas. Meerkats are highly social, communal animals that live in packs of up to 30 members encompassing up to three distinct family groups. 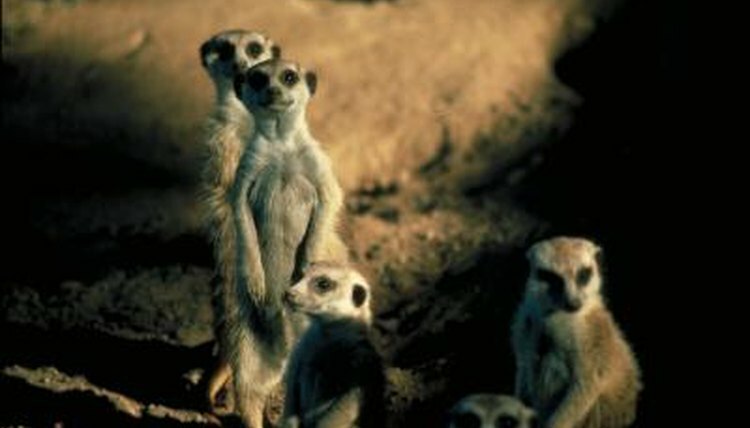 The meerkat pack is communal and egalitarian. All members take turns as sentinels for the group; and all non-breeding pack members assist in caring for and rearing the pack’s babies. The social structure of lemur species is diverse. Some lemurs are solitary creatures, while other species may gather in groups or small family units. Ring-tailed lemurs, for example, live in female-dominated troops of up to 17 members. Female meerkats give birth to two to four young per year and can breed throughout the year. In contrast, female ring-tailed lemurs only breed from mid-April through June and typically have a one or two offspring per year. Unlike meerkats, the lemur, similarly to other primates, has a complex communication system that includes body language, vocalizations -- the indri's call sounds like whale song -- and scent markings. Ring-tailed lemurs are day-active and spend much of their time on the ground, which is rare for primarily arboreal lemurs. The mouse lemur, in contrast, spends all its time in trees, and is active at night. Meerkats are essentially day-active, but they will retreat underground if it is too hot or is raining. What Family Is the Yak In? What Does a Ring-Tailed Lemur Look Like? What Kind of Community Does the Lion Live In? Where Does the Tundra Wolf Live?